Shown on the plan attached is the site of two buildings numbered as 34 and 36 High Street South but purportedly formerly known as Robbs Yard. These three storey brick built properties are within the ownership of Manns (Northampton) Brewery Co. Ltd., Northampton and are currently leased to Mr. Moore the greengrocer at 26 High Street South. 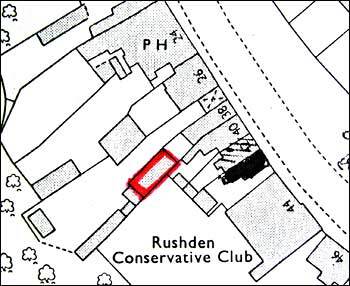 No entries are contained in the Rushden Urban District Council's register of houses in Clearance Areas respecting these properties although the register does refer to 28, 30 and 32 High Street South where demolition was undertaken in November, 1949. Their present use is as storage in connection with the lessee's shop trade and it may be that this use was current even at the time of demolition of the other properties within this yard. Evidently constructed as dwelling houses and still retaining fireplace fixtures and stairways the buildings are blind-backed onto land owned by the Rushden Conservative Club. The lessee acknowledges that the buildings are in poor repair and the roofs are now leaking and unsound. 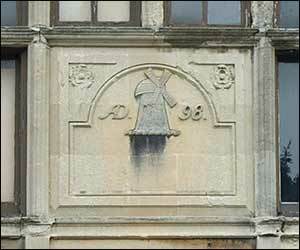 In consequence his use of the buildings is limited to storage of a small quantity of unspoilable items such as potatoes. was later the greengrocery of George Moore.